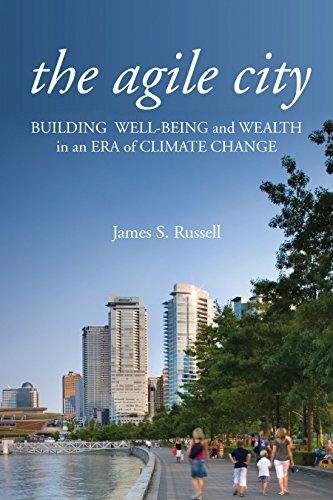 [PDF] The Agile City: Building Well-being and Wealth in an Era of Climate Change | Free eBooks Download - EBOOKEE! Description: In a very short time America has realized that global warming poses real challenges to the nation's future. The Agile City engages the fundamental question: what to do about it? Journalist and urban analyst James S. Russell argues that we'll more quickly slow global warming-and blunt its effects-by retrofitting cities, suburbs, and towns. The Agile City shows that change undertaken at the building and community level can reach carbon-reduction goals rapidly. Adapting buildings (39 percent of greenhouse-gas emission) and communities (slashing the 33 percent of transportation related emissions) offers numerous other benefits that tax gimmicks and massive alternative-energy investments can't match. Rapidly improving building techniques can readily cut carbon emissions by half, and some can get to zero. These cuts can be affordably achieved in the windshield-shattering heat of the desert and the bone-chilling cold of the north. Intelligently designing our towns could reduce marathon commutes and child chauffeuring to a few miles or eliminate it entirely. Agility, Russell argues, also means learning to adapt to the effects of climate change, which means redesigning the obsolete ways real estate is financed housing subsidies are distributed transportation is provided and water is obtained, distributed and disposed of. These engines of growth have become increasingly more dysfunctional both economically and environmentally. The Agile City highlights tactics that create multiplier effects, which means that ecologically driven change can shore-up economic opportunity, can make more productive workplaces, and can help revive neglected communities. Being able to look at multiple effects and multiple benefits of political choices and private investments is essential to assuring wealth and well-being in the future. Green, Russell writes, grows the future. No comments for "[PDF] The Agile City: Building Well-being and Wealth in an Era of Climate Change".